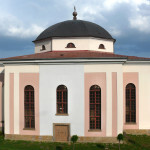 In the late 18th century and early 19th century, architecture in Slovakia was determined by several important social circumstances – the reforms of Joseph II that sparked the modernisation of Hungarian society; technological progress; industrial and transportation developments that influenced the economy; and last but not least, rediscovery of Ancient Greek and Roman tradition as an inspiration and a model. The reforms of Joseph II also encouraged construction of new Jewish synagogues and churches of the Reformed Churches, which sparked construction of new building types. Protestant churches were characterised by a simple central plan, or rather a slightly lengthened plan, and a two-level choir. They had a big seating capacity. The interior was usually plainly decorated – only with detailed pilaster capitals and simple mouldings. External appearance of these churches was plain as well. Tall roofs without towers and facades with plain arch windows and a simple portal were typical of them. 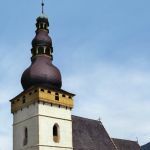 Examples of such churches are the Great Evangelical Church in Bratislava designed by Matthias Walch and built in 1776; and the Evangelical churches in Banská Bystrica, Banská Štiavnica and Levoča – these churches follow Walch’s concept. Walch could use his experience with designing large gathering places in the 1870s, when he was assigned to design a new building of the city theatre in Bratislava. In his last work – the lyceum in Bratislava – he used simple Classicist forms and a rationally arranged plan. Assignments given to the architect Matthias Walch illustrate the extension of the investment activity from religious buildings and mansions to public buildings like schools, theatres and county halls. The first public buildings built in the Classicist style are the County Hall and the City Hall in Košice ( J. Langer, 1779 – 1780), the Redoubt in Kežmarok (1818), the County Hall in Levoča (A. Povolný, 1830), and the town theatres in Košice (1789) and Trnava (1831). A remarkable example of the Classicist, or rather the Empire style, is the oldest brick theatre in Slovakia that is still preserved – the little Empire theatre near a manor house in Hlohovec (1802). However, the first industrial and transportation buildings were built in the Classicist style as well – for example the Horsecar Station in Bratislava (I. Feigler Sr., 1840) and the oldest buildings of iron and steel companies in the Pohronie region. War conflicts gave rise to large numbers of injured people and new knowledge concerning healthcare sparked the development of spas. The first brick buildings in the oldest spa towns in Slovakia – Piešťany, Bardejov and Sliač – were built in the early 19th century. These spas are characterised by simple right-angled layout with long corridors, colonnades, flat pilasters and pediments on the facade. The Napoleon Spa in Piešťany (1822) was built in this simple Classicist style. Although only a few mansions were built in the period after the Napoleonic wars, there are two exceptional manor houses in Slovakia that show us the purest form of Classicism – the manor house in Dolná Krupá and in Topoľčianky. The Manor House in Dolná Krupá was rebuilt from 1813 to 1822 in the Classicist style. 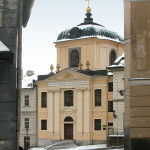 The reconstruction was probably designed by Anton Pius Rigel (1789 – ? ), who was strongly influenced by Palladian architecture. This influence can be seen in the simple tall portico of the garden front and in the theatre that is situated in the area of the manor house which resembles an ancient Greek temple. Rigel was also involved in designing the English-style landscape garden. 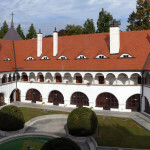 The garden and the outbuildings constituted a unified complex that is considered to be one of the most valuable Classicist areas in the Hungarian Kingdom. 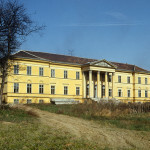 During the same period (1818 – 1825), the Renaissance manor house in Topoľčianky was rebuilt in the Classicist style. The reconstruction was designed by a prominent Austrian architect Alois Ludwig Pichl (1782 – 1856). He designed a new symmetrical wing with the main entrance placed in its centre. The entrance consisted of a distinctive bay and Corinthian columns supporting a triangular pediment. The round hall situated upstairs was crowned by a dome with a lantern. A library made part of the Classicist wing too. It was decorated with busts of ancient personalities and with a row under the ceiling cornice depicting ancient Greek art and science. The Manor House in Topoľčianky also had an English landscape garden with a neo-Gothic greenhouse and a Chinese and a classical pavilion. References to different historical periods and cultural traditions foreshadowed the feelings of the investors and architects of the late 19th century, when architecture was returning to various historical patterns.